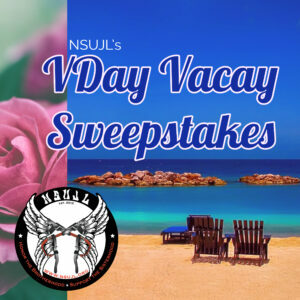 NSUJL's VDay Vacay Sweepstakes! | NSUJL Enter to Win Now! 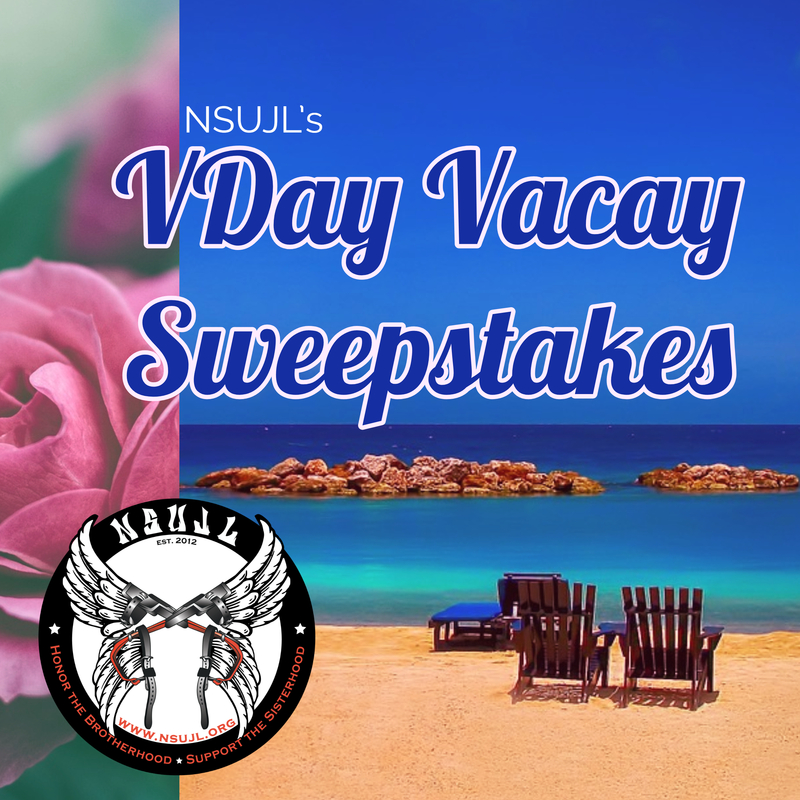 Announcing NSUJL’s VDay Vacay Sweepstakes: February 1st -28th, 2019! Multiple line-families across the United States currently have an overwhelming need for our support. Unlike other foundations, NSUJL will provide both immediate and long term assistance to these families. Through us, these line-families can and will receive physical, emotional and financial support for up to 12 months. Additionally, age-appropriate children of fallen linemen can also receive college scholarships through NSUJL’s John Plante Scholarship Fund. Our ability to aid current and future line-families depends solely on your support. NSUJL is holding a Valentine’s themed sweepstakes during the month of February to help raise additional funds to support our cause. 100% of this fundraiser’s proceeds, less the cost of our grand prize, will benefit the organization’s mission. All persons who donate to NSUJL during the month of February will be entered into our VDay Vacay Royal Caribbean International Cruise for Two Sweepstakes. Donate $25 to a line-family in need and be automatically entered into our VDay Vacay Sweepstakes. Any increment of $25 counts as an entry. So a donation of $100 will count as 4 entries. Your donation is tax deductible! There’s no limit to the amount of entries you can make. We will go live on March 8th to announce the winner. Enjoy an Ocean View stateroom for two for a (4- or 5-night) cruise to the Bahamas or the Caribbean, available year-round! Your ocean view stateroom includes two twin beds (can convert into queen-size), vanity area, private bathroom and picture window or porthole. Bahamas – Explore Ernest Hemingway’s old haunts in Key West. Play with dolphins on a Nassau adventure. Recline on the sugar-white beaches of Royal Caribbean’s private destination, CocoCay. Close to the East Coast, these breathtaking island beaches are an unforgettable escape from the harsh winter weather back home. Departures available from Miami and Port Canaveral to ports such as Key West, Nassau and CocoCay. Caribbean – When it comes to beautiful beaches and sparkling blue waters, the Caribbean is really in a league of its own. There are countless adventures within reach on your cruise vacation. Enjoy Royal Caribbean’s private beach destination Labadee, Haiti, with the world’s longest zipline over the water or explore the Mayan Ruins in Cozumel. Departures available from Port Canaveral, Ft. Lauderdale, Tampa, or Miami, to ports such as Cozumel, Belize, Honduras, Key West, Grand Cayman and Jamaica. Your days at sea can be packed with activities from morning ’til night or you can just spend time relaxing. Go rock climbing, ice skating, go surf simulating on the Flowrider®, play mini-golf, try yoga or a gourmet cooking class, go shopping, or just relax sunbathing. Visit our store here to donate! Your Ocean View stateroom is based on double occupancy and is inclusive of cruise fare, taxes, and gratuities. Your cruise also includes all standard meals (except specialty restaurants and outlets), on-board entertainment, activities, and a state-of-the-art fitness center. Shore and land excursions not included. Upgrade to a higher stateroom category or add a third or fourth guest to your stateroom, at a fee, subject to availability. Sailings on the following ships: Brilliance, Independence, Navigator and Freedom. Certificates can be upgraded or applied to different sailings at time of redemption. Note: Ports, ships, itineraries, sailing dates and availability are subject to change. Blackout dates: Last two weeks of December (Christmas/New Year’s sailings). Must be booked a minimum of 60 days in advance. Reservations are subject to availability. Certificates cannot be replaced if lost, stolen or destroyed. All purchases are non-refundable. Packages cannot be resold. Suggested retail value is calculated using tariff rates. Ground transportation is not included. The VDay Vacay Royal Caribbean International® Cruise for Two (the “Contest”) begins at 12:01 am EST on February 1st and ends at 11:59 PM EST on February 28th, 2019. The winner will be notified by e-mail on or about March 8th, 2019. The Contest is Sponsored by the National Sisterhood United for Journeymen Linemen, 14 S Mountain Blvd, Mountain Top, PA 18707. The Contest is open to individual legal residents of the United States of America who are 18 years of age or older at the time of entry. Directors, officers, shareholders, employees, and agents of Sponsors, as well as directors, officers, shareholders, employees and agents of advertising and/or promotional partners and agencies of Sponsors, and the immediate families (spouse, parent, children, siblings, and their spouses) of each of them are not eligible. The Contest Winner will be sent by registered mail the prize package publications and vouchers and must redeem all prize components by Dec 31st, 2019 unless otherwise marked. The Contest is subject to all applicable federal, state and local laws and is void outside of the United States of America and in any jurisdiction where prohibited or restricted by law. This sweepstake is governed by the laws of Pennsylvania. In the event of any dispute regarding this sweepstakes, entrants agree that such disputes shall be resolved by arbitration in Luzerne County, Pennsylvania. Each Contest Entrant may only submit One entry. Additional Entries from the same entrant will not be considered. All entries must be received no later than February 28th, 2019, at 11:59 PM Eastern Standard Time and must be submitted by mail to VDay Vacay Sweepstakes, C/O NSUJL, 14 S Mountain Blvd, Mountain Top, PA 18707. Anyone that voluntarily donates $25 or more to NSUJL between February 1st, 2019 and February 28th, 2019 via PayPal at donations@nsujl.org or via mail during said Contest dates will be automatically entered. Sponsorships and membership payments/renewals are ineligible; . No responsibility is assumed by the Sponsors for any problems or technical malfunctions of computer online systems, servers or providers, computer equipment, software, failure of any email or entry received by sponsors on account of technical problems or traffic congestion on the internet or at any website or any combination thereof. Entrant is responsible for all online charges incurred by any internet service provider. Sponsors are not responsible or liable for lost, stolen, mutilated, incomplete, illegible, misdirected or non-delivered entries. Surprise Valentine’s themed gift basket including various items and/or gift cards to share with your loved one. The winner will be selected at random by National Sisterhood United for Journeymen Linemen staff on or around March 8th, 2019, from among all eligible entries received. The winner will be selected during a Facebook Live event. The winner will be notified by email on or about March 8th, 2019. Notifications returned as undeliverable as addressed or the failures of the winner to prove eligibility, will result in an alternative winner being selected. Winners are required to produce proof of identity and proof of age. Only the prize set forth above will be awarded. The prize is non-transferrable. The winner is responsible for all applicable federal, state and/or local laws and winner is also solely responsible for all applicable taxes. By Entering the Contest, participants agree to be bound by the complete Official Rules and decisions by the Sponsors shall be final in all matters relating to this Contest, Sponsors and participating promotional companies are not in any way liable for damage, loss or injury resulting from computer malfunctions, misdirected or incomplete entries or acceptance and use of the prize. Participants also agree to receive mailings and emails from NSUJL via NSUJL’s mailing list. NSUJL does not share or sell participants’ personal information to third party companies. Winner assumes all liability for injuries caused or claimed to be caused by participation in the contest, or the use or misuse of any Prize granted herein. By accepting the Prize, the winner consents to the use of his/her name, photograph, or other likenesses, testimonials, and other biographical information for any and all purposes, including but not limited to, advertising, trade and/or promotion on behalf of the sponsors without further compensation, unless prohibited by law. To be notified of the Contest Winner, send a separate stamped, self-addressed envelope, after March 8th, 2019 to: VDay Vacay Sweepstakes, C/O NSUJL, 14 S Mountain Blvd, Mountain Top, PA 18707. Sponsors reserve the right to change these rules or cancel the contest at any time, in their sole discretion. If you have any questions about these official rules or the contest, please e-mail them to sweepstakes@nsujl.org or send written questions to: VDay Vacay Sweepstakes, C/O NSUJL, 14 S Mountain Blvd, Mountain Top, PA 18707. This promotion is in no way sponsored, endorsed or administered by, or associated with Facebook, Instagram, Twitter or other social media platform. You understand that you are providing your information to the owner of this page and not to Facebook, Instagram, Twitter or other social media platform. Happy Journeyman Lineman Recognition Day! Welcome Local 125, Portland Oregon!